Other Common Names · Fiddleback, Violin, or Brown Spider. Species · Loxosceles reclusa, L. laeta, L. deserta, L. unicolor, L. arizonica, L. rufescens. · Fiddleback, Violin, or Brown Spider. · Loxosceles reclusa, L. laeta, L. deserta, L. unicolor, L. arizonica, L. rufescens. 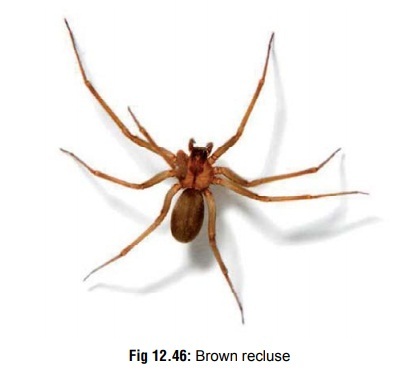 · It is a small (6 to 20 mm long), orange or reddish brown or grey spider, with a brown violin shaped mark on its back (Fig 12.46). It infests dark areas such as basements, under rocks, and amid woodpiles. The female is more aggressive than the male and bites when provoked. · Loxosceles spiders can be differentiated from most other “garden” brown spiders, of which there are many, by its set of six eyes (three pairs), rather than eight. Their webs are distinguished by a bluish hue. · The venom is cytotoxic and consists of several toxic compo- nents including hyaluronidase, ribonuclease, deoxyribonu-clease, alkaline phosphatase, lipase, and sphingomyelinase D. The last mentioned is the main constituent which is responsible for tissue destruction. It reacts with sphingomy-elin in the RBC membrane causing the release of choline and N-acylsphingosine phosphate. This causes severe intra-vascular occlusion of micro-circulation leading to necrosis. · Venom toxins may act as proteases upon molecular constitu-ents of plasma extracellular matrix (fibronectin and fibrin-ogen), and basement membrane constituents (entactin and heparin sulfate proteoglycan). All of these degrading activi-ties may be responsible for producing haemorrhage, delayed wound healing, and renal failure, as well as the spreading of other noxious toxins (e.g. dermonecrotic protein). By disrupting the subendothelial basement membrane, blood vessel wall instability and increased permeability can occur. · The bite itself is usually painless, but later begins to bleed and ulcerate in 2 to 8 hours. The initial reaction often consists of erythema and pain or pruritus. A small vesicle may form at the bite area, and the lesion may take on a “bullseye” or “halo” appearance, having a central vesicle surrounded by an erythematous and ecchymotic area. · Ulcerated lesions if untreated, usually enlarge until about a week when eschar formation takes place. Granulation and healing takes up to 2 months to be completed. · In severe cases, cutaneous necrosis may occur and may extend to involve subcutaneous fat and muscle. · Systemic features (“loxoscelism”) include fever, chills, nausea, skin rash, myalgia, arthralgia, headache, vomiting, haemolysis, DIC, shock, renal failure, jaundice, convulsions and coma. · Acute tubular necrosis with resulting oliguria or anuria may develop in patients with severe haemolysis. · Fever is common in patients with systemic effects and may develop more often in children. Fever may be associated with chills and night sweats. · Leucocytosis (20,000 to 30,000 per cubic mm). · Evidence of haemolysis and DIC: Decreased levels of fibrinogen, clotting factors, and platelets; increased levels of fi brin degradation products; prolonged PT and PTT; spherocytosis, positive D-dimer assay, and Coombs-positive haemolytic anaemia. · Abnormal renal and liver function tests. · Immobilisation of bitten extremity. · Analgesics: Persistent pain may necessitate lumbar sympa-thetic blocks. Application of cold compresses may help. · Antipruritics: Diphenhydramine 5 mg/kg/day orally, with a maximum dose of 25 to 50 mg four times a day. Hydroxyzine may also be used: 25 to 50 mg every 6 to 8 hours; maximum dose 400 mg/day. Antibiotics, if wound gets infected. · Admit patient to hospital and monitor for evidence of haemolysis, coagulopathy and renal failure. · If haemoglobinuria occurs, renal failure may be prevented by increasing IV fluids, and alkalinising urine. · Significant haemolysis should be treated with transfu-sions.